The Lean column reflects the design of Lean by James P. Womack and Daniel T. Jones (i.e. Lean in 2017). 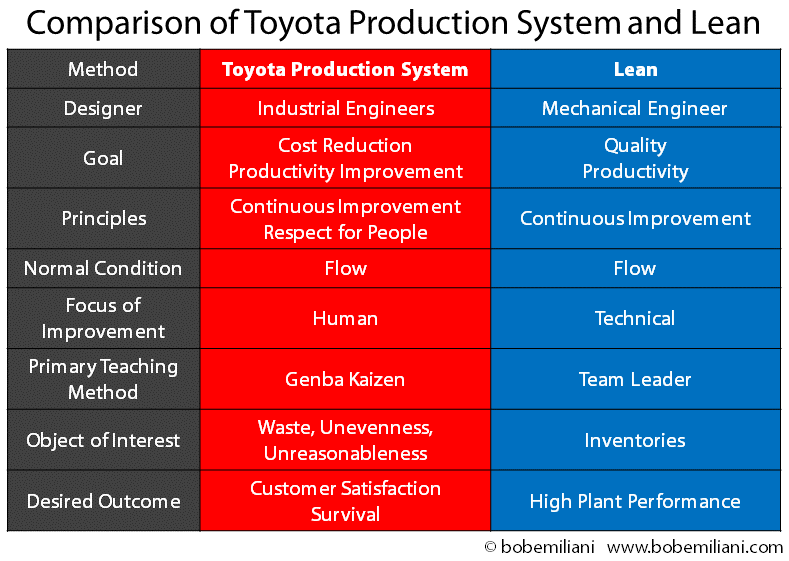 In the previous post, Why Lean Keeps Thriving, I used the image at right to show how Lean has drifted far from it’s original interpretation in 1988 as being synonymous with the Toyota Production System (exclusive of the “Respect for People” principle until ca. 2007). The drift in the meaning of Lean that has occurred in the nearly 30 years since then has been the result of work by James P. Womack and Daniel T. Jones. 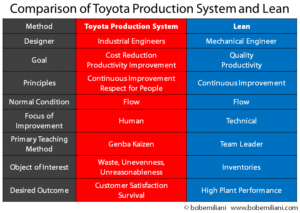 What I hope to show in this blog post is that the Toyota Production System (TPS) – inclusive of the “Respect for People” principle – is what produces business results, and that Lean does not. This is not to say that Lean does not help people make needed improvements. It is to say that Lean does not produce the business result that leaders want and that businesses serving competitive markets need on a continuous basis. 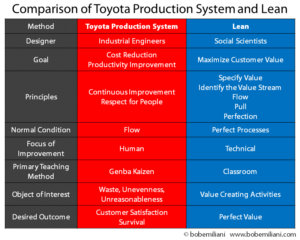 After all, business results were the raison d’etre of the Toyota Production system (click here and here to learn more). 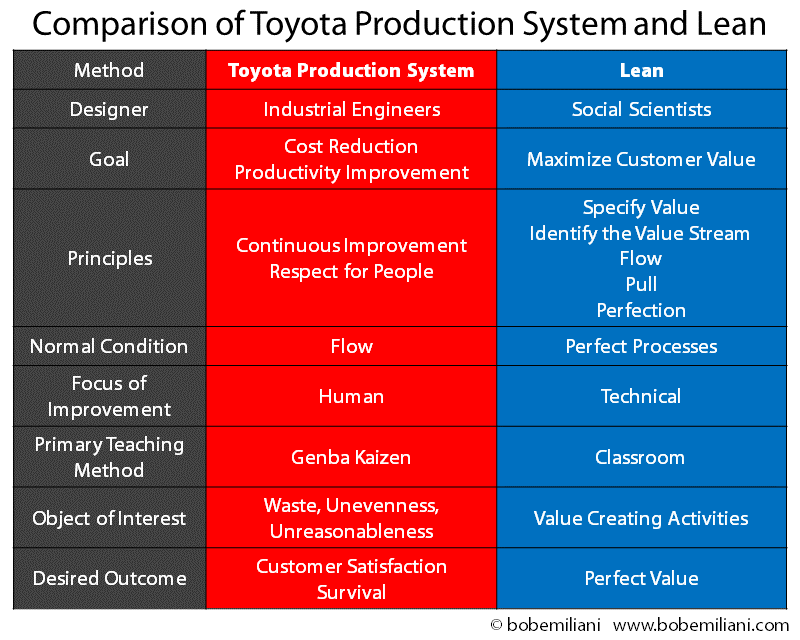 The raison d’etre of Lean, with its emphasis on value, is less clear. It is my view that both Lean promoters and enthusiasts commonly lose sight of the business need, which greatly frustrates executives. And they make improvements far to slowly (often to things that don’t much matter), which also greatly frustrates executives. Businesses operating in competitive markets must always focus on cost reduction. But, a parallel conversation must also exist to ensure a focus on achieving business results. Meaning, assuring profit in every process and for the company overall with TPS. Producing business results means breaking the Lean = TPS paradigm (or assumption) that almost all Lean advocates have lived under since the book Lean Thinking was published 20 years ago. The purpose of doing this is reinforce the practical need to produce tangible business results (to better serve customers, satisfy investors, etc.) and to re-calibrate or re-connect Lean to TPS. The need for tangible business results should be clear. But why the need to re-calibrate Lean? It is to bring Lean back closer to its 1988 meaning; to eliminate wasted resources, end confusion, re-focus people, and re-discover the close (but nowhere near exact) relationship to TPS. The image at right shows how Lean in 1988 was a much closer interpretation of TPS than Lean is in 2017. In addition, if Lean does not produce tangible business results, then executives will soon move on to alternatives methods that do produce tangible business results. Most of these methods are zero-sum, which means one stakeholder gains at the expense of other stakeholders. 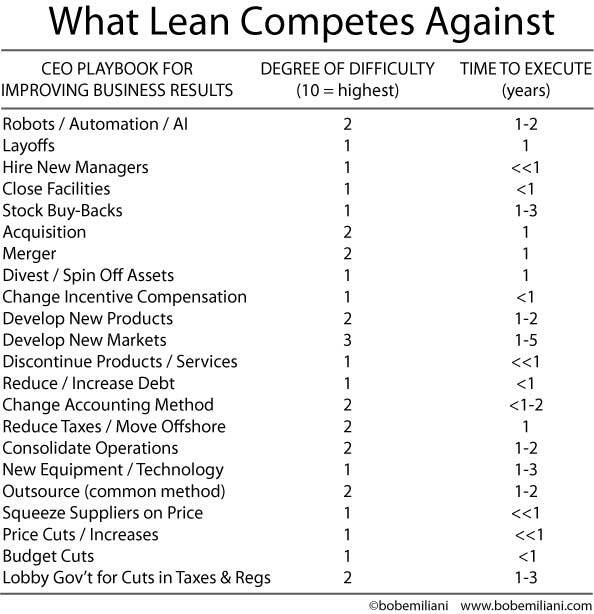 In other words, Lean competes against other methods of business improvement, though not necessarily on a fair basis. TPS is non-zero-sum, while the alternatives methods are zero-sum and therefore designed to do harm to other stakeholders. And they can be applied quickly. Executives now have more choices than ever before for methods of business improvement. For Lean to survive the intense competition among improvement methods available to business leaders, it must deliver tangible business results quickly. (Note: Many elements of the CEO playbook occur simultaneously with or without Lean). Simply put, the 1988 version of Lean is better able to deliver tangible business results quickly compared to the 2017 version of Lean. While the 1988 version is much closer to TPS, it is not close enough. When we think of the organizations that have had great success, we think of Danaher, Wiremold, Virginia Mason, Autoliv, and others. The common denominator among these organizations is the relatively quick transformation from conventional management to a facsimile of Toyota’s management system, particularly the application of TPS to operations – almost always with the help of former Toyota industrial engineers. Financial and non-financial data from these organizations clearly show continuous improvement in business results over time. In John Krafcik’s 1988 paper, “Triumph of the Lean Production System,” he concluded by saying: “Those Western producers with access to these resources [developing a well-trained, flexible workforce, product designs that are easy to build with high quality, and a supportive, high performance supplier network]… will find lean-system implementation comparatively painless; those without such resources will have a much tougher time.” It was former Toyota industrial engineers who helped Danaher, Wiremold, etc., develop those resources which facilitated their TPS/Lean implementation. I’m sure the leaders would say it was not quite painless. But I am sure that they will say it was necessary for corporate survival in tough, competitive markets, and it was also a hell of a lot of fun for managers and workers alike. Those who follow 2017 Lean may be without such resources and therefore have a much tougher time. One thing missing for 20 years (post 1988) was the relationship between the “Respect for People” principle and tangible business results. I know in my own work, as a long-time advocate of the “Respect for People” principle, many people assumed that I did not understand the pressure on executives to deliver business results. On the contrary. I always understood the pressure. But I also saw the “Respect for People” principle as the enabler of business results (profits) and as the key to a far better work experience for managers and workers alike. My book, Better Thinking, Better Results, was the first to comprehensively document financial and non-financial results in relation to the “Respect for People” principle. Those findings aligned perfectly with my own experiences as a manufacturing manager in a plant site undergoing a TPS/Lean transformation with the help of Shingijutsu kaizen consultants. Business leaders strongly favor the quickest and easiest methods that produce business results, even if they are zero-sum and irrespective of potential downsides. 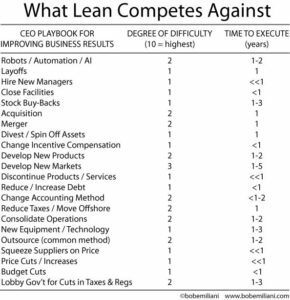 The quick, zero-sum improvement methods shown in the image above have enormous competitive advantage compared to Lean 2017, but not necessarily to Lean 1988. Any method leaders choose to improve business results requires investments of one type or another. Transformation from conventional management to Toyota-style management can be do-it-yourself. That is one type of investment. Or, the leaders can get help from former Toyota industrial engineers (whose raison d’etre for helping organizations improve goes far beyond a paycheck). That is another type of investment. Choose wisely. I particularly liked your comments on “Respect for People”. When studying Dr. Deming one of his most salient contributions was the realization that most workers are doing the best they can and it is the responsibility of management to improve the system. This often gets lost in the implementations of Lean and or Six Sigma. Our objective is to reduce waste, in all its forms, and many times this is lost. Thank you for this well written blog. Great! I’m happy that you like my blog!